Philippe Senderos and Gael Clichy made their comebacks after injury problems in the Arsenal V West Ham reserves game at Upton Park on Tuesday night. Arsenal beat West Ham 2-1. Senderos has been out with a shoulder injury which he picked up at the World Cup and has been sidelined since the start of the season and is yet to play a game at the new stadium. The same for Clichy who has been out with a foot injury. Arsenal fans will be delighted to see the duo back to 1st team action for the Gunners. Our victory at The Valley will be remembered for Robin van Persie's winning goal. It was outstanding, quite unbelievable and something which nobody was expecting. Emmanuel Eboue got forward well on the right but when he crossed the ball I couldn't see anybody in the box. Then suddenly Robin arrived and, technically, his volley was perfect. It had power and pace and finished in the top corner. It was the goal of a lifetime. 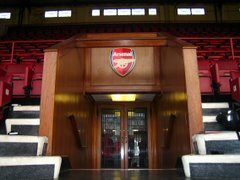 Was it the best I have seen during my 10 years at Arsenal? Well, I must check because I have seen plenty of good ones, but it is certainly in the top five. Robin was booked in the first half and, just after that incident, I waited a bit to see how he responded. That is football - if I had substituted him, people would have said I did the right thing, if he got sent off after the first incident people would have said I was stupid. That shows that, as a manager, you need luck as well because I kept Robin on and he went on to score two goals, including his fantastic winner. Overall, I think Robin has matured. He clearly has the talent and when you can adjust to the right attitude then you can become a great player. But first you need the talent. He has that and the attitude you can work on. He is getting better and better. As Robin has shown, he can score goals. He has that quick, spontaneous movement that tells you he has class. His first goal was less spectacular but if you examine it you can see he did not need much time. He controlled the ball instantly and then it was in the net. As for the game itself, I felt that Charlton fought very hard. When you go away after a Champions League game and then go 1-0 down, you need some quality to win. We could have finished it off a few times, but Charlton could also have come back with a few minutes to go. Their best chance was Jimmy-Floyd Hasselbaink's late header. When I saw the ball going to him I thought it would be 2-2 but, luckily for us, he missed. Hasselbaink did set up their goal, of course. I thought it looked offside but the replay showed it wasn't. Maybe Kolo Toure played him onside. We have found some momentum now. We have won twice away from home ? Charlton and Manchester United - and two Champions League games. So it is five games on the trot, but the negative thing is the interruption now for international duty. When the players come back from international games they do not have the same focus on club football as they do before they go. We will have to get our attitude right though because we have a Champions League game in Moscow in the week after the international break. I really wished I'd bought a ticket to the away game at Charlton, it sounded like a brilliant game right until the final whistle with both teams going for chances. I was listening on the radio as I scanned in photos for my brothers 21st and was so disappointed when we went one goal down. I thought it was going to be another of those games where we play the most beautiful football, have most of the possession but are denied getting a goal by the opposing team's backline. It was like listening to a repeat of an away game last season ... been here a few times before. Then Robin Van Persie scored an amazing goal which was sent across from Helb, who himself did some great footwork to keep possession. I was delighted and couldn't wait till Match of the Day. I was really pleased for Robin VP as well, he is one of my favourite players, a delight to watch and always disappointed for him when he doesn't score the goal. And then there was "that goal", the commentators where gushing about the goal again and again and even after the match said whatever you do don't miss MOTD. You think to yourself, "it must be some goal" but I wasn't prepared for how brilliant RVP's volley was - it does look like it is going to go above the post but curls in to find the top corner. It was a cracker, top drawer and well celebrated by RVP. I agree it is definitely a contender for goal of the season - well done Robin Van Persie! Can't wait till the next game at the Emirates ... I feel this is going to be a good season.